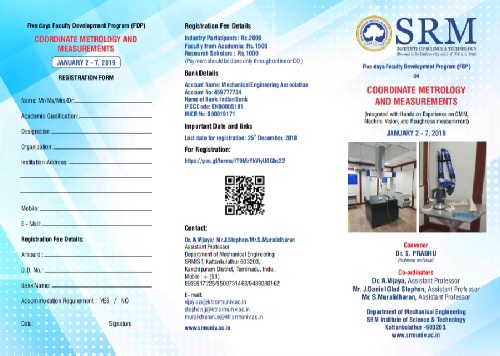 A Five Days Faculty Development Program on Coordinate Metrology and Measurements Integrated with Hands on Experience on CMM, Machine Vision, and Roughness measurement, organized by the Department of Mechanical Engineering, SRM Institute of Science and Technology. Coordinate Metrology plays a vital role in measuring components/ products size and form in the manufacturing industries and OEMs. The coordinates are measured by probing the parts using modern equipment like CMM, Laser scanner, Machine Vision, Profile Projector. These machines possess its software which it’s a mathematical surface/element on the acquired coordinates for measurements. There are several strategies to be followed while probing the parts to reduce the error associated with it. This faculty development program provides a platform for young researchers/faculty members to learn the theoretical basis, latest trends/features in equipment from different Industries along with hands-on training on measuring machines like CMM, Portable CMM with laser scanner, Machine Vision, Profile Projector and Surface roughness tester. Researchers who have the thrust to do reverse engineering, uncertainty measurements in CMM and want to analyze the roughness and form error along with its surface defects of machined surface/cast products. Organised by the Department of Commerce, Faculty of Science and Humanities, SRM Institute of Science and Technology. Open to all Post Graduate Students and Research Scholars. Two-day Workshop conducted by Entrepreneurship Development Institute of India, organised by the Department of Commerce, Faculty of Science and Humanities, SRM Institute of Science and Technology. The Resource person, Mr. Rangaraj Pandey spoke about the importance of journalism in this current era, and explained the tactics and way on how the reporting should be done by a journalist. He also emphasized on the courses which are offered for journalism and stated why one should be taking up this course and this field as one would excel in the field of journalism. On 9th and 10th January, the Department of Commerce, Faculty of Science & Humanities had organized a special two day workshop on entrepreneurship development for the students of the department to develop their entrepreneurship competencies. The session was conducted by Mr Shibin Mohamed TK, in which he described various key aspects of entrepreneurship. On the first day, the morning session started with the introduction about entrepreneurship, a video about the importance of initiative and innovation was shown to the audience and then a discussion about 15 types of entrepreneurial competencies was conducted. Mr Shibin explained about the concept of start-up and how an idea leads to business. He explained about various mistakes that might occur in the process of developing an enterprise and about how to deal with the same. In the afternoon session all the students attended a common test to assess the qualities of leadership in themselves and understood about the areas that they should develop. On the second day, a brief discussion about solving real time problems that exist in entrepreneurship by innovation was conducted, later all the students were divided in to ten different teams and asked to come up with an innovative start-up idea. Students were given a few hours of time and asked to draw their business plan which shows details about the problems that it solve, threats that are to be faced, competitors, and capital structure and were also asked to explain about their idea as a presentation to the audience. Overall it was an interesting and productive workshop for the students. Workshop on "Learn to Teach" and "Teach to Learn"
The eleventh edition of National Conference on Mathematical Techniques and Applications (NCMTA-2019) was conducted on 11th and 12th January. The conference started with invocation song and was formally inaugurated by the lighting of the Kuthuvilaku followed by the welcome address given by Dr A. Govindarajan, Professor and Head, Department of Mathematics. He emphasized the need for conducting the conference by stating that it was a platform for budding researchers in the field of Mathematics. He added that it was an opportunity for all staff and researchers to publish their work in Scopus indexed journal source as the extended proceedings of the conference which was likely to be published in Scopus indexed journal, American Institute of Physics (AIP conference series). The presidential address was given by Dr. S. R. S Prabhakaran, Joint Director (Research) SRMIST. In his address, he briefly discussed the need for Mathematics in space study by discussing the use of string theory to determine the injection points in the satellite launch vehicle for the study about Mars. He also mentioned the current status of the university which has developed from an engineering college to a university with Autonomous status. Dr Sundarammal Kesavan introduced the chief guest and Alumnus Mr Kritik Abiram Govindan, Director and Chief Executive Officer, Anjana Software Solutions Private Limited, Chennai. In his inaugural address, the chief guest, Mr.Kritik Govindan was proud of being an alumnus of the then SRM Engineering College and he shared his growth in his career from IT personnel to an entrepreneur to the audience. He emphasized the need for developing analytical abilities and the importance of Linear Algebra in the 21st century. This was followed by the release of the conference proceedings. The vote of thanks was given by one of the coordinators Dr P. Sambath. There were eight eminent speakers drawn from esteemed institutions like IITs, NITs, Bangalore University, Anna University and BARC Mumbai who enthralled the audience with their presentations ranging from basics to current research in the field of Mathematics. The first lecture was delivered by Dr T. N. Shanmugam, Professor from Anna University Chennai, who spoke on the use of Complex numbers in Engineering. He mentioned how complex functions are applied in the field of Engineering and Technology. The second speaker of the day is Dr Debanik Roy from BARC, Mumbai who gave a session on the topic “IN-SITU Vibration Analysis of Flexible Robotic Systems using Interval Mathematics Model & Data Synthesis”. The post-lunch session of the first day witnessed two more presentations “Numerical Simulation for a Class of Fractional Differential Equations” by Dr A. S. V Ravi Kanth from NIT Kurukshetra, Haryana and “Intervals of Invertible M-matrices and Inverse M-matrices” by Dr K. C. Sivakumar from IIT Madras. Dr.Ravi Kant explained various numerical simulation methods and how numerical simulation techniques are useful for Engineers to get solutions of fractional differential equations. Dr.K.C. SivaKumar narrated about the existence and uniqueness of Invertible M-matrices and inverse M-matrices and also informed their effective applications in the field of optimization problems. The second day had an early start with two invited talks by Dr J. Baskar Babujee on “Cordial Words Recognized by Automata” and the presentation by Dr B. Krishna Kumar on “Retrial Queueing System for the Performance of ARQ Error Control in an LTE Transmission System” both dignitaries were from Anna University, Chennai. Dr.J.Baskar Babujee explained the basic concepts about grammar, automata, Language, cordial labelling with examples and informed how they are generated and applied in the field of Computer Science. Dr.B.Krishna Kumar briefly explained the key features of Retrial Queueing system, the concepts, the process were interpreted with examples. He also highlighted that Mathematicians are given importance in France and other European countries and explained how Mathematicians are given importance at par with any other Engineer in their country. The afternoon session witnessed talks by the plenary speakers Dr H. P. Rani from Nit Warangal on the topic “Hydrodynamic Instability and Transition to Turbulence” followed by Dr G. Nanjundan’s session on Characterization of Zero-Inflated Continuous Distributions. Dr.H.P.Rani, Associate Professor, NIT, Warangal insisted the need for any dynamical system to be stable and the criteria for instability of Magnetohydro dynamical systems with Turbulence flow character. Dr.Nanjundan highlighted the importance of continuous distributions and the need for characterization of zero-inflated continuous distributions in Statistical analysis. The conference received 275 research papers of which 225 were selected for presentation after peer review. Nearly seventy participants represented India as a whole from states like Andhra Pradesh, Telungana, Karnataka, Kerala, Haryana, Rajasthan and the remaining from Tamilnadu. There was a paper from Portugal paving way for an international conference in future. The paper presentations by the delegates took place in six parallel sessions organized on both the days of the conference. The two days function came to a close with the valedictory function which began with the welcome address given by Prof. K.S. Ganapathy Subramanian.Dr. N. Parvathi introduced the Chief GuestMr. Madhan Shanmugasundaram (Alumnus SRMEC-1993 Batch) Director, Infosys Technologies Chennai. The chief guest explained the uses of Mathematics in day to day life and how it is being used in the field of Space Science stock market, film industry andDr. V. Srinivasan delivered the detailed conference report. The feedback given by the participants was in appreciation of the organizing committee and complimented all the participants for their contribution to the field of Mathematics. The coordinator of the conference .Dr. S. Sangeetha proposed the vote of thanks. This was followed by the distribution of certificates to the participants. The closing of the conference witnessed a sense of fulfillment from the participants in their feedback. The curtains came down with the National Anthem and a group photo session to add to our memories. The Department of Clinical Psychology conducted a two day workshop on the Treatment and Education of Autistic and communication handicapped Children(TEACCH) approach on18th &19th of January 2019. The program was organized in association with the SRM Alumni Association- Clinical Psychology of SRM Medical College Hospital & Research Centre . Dr.Bindhiya Shajith, M.Ed, Ph.D from Bangalore was the resource person. The students and professionals from Physiotherapy, Occupational Therapy, Speech Therapy as well as Clinical Psychology participated in the workshop. To explain the provisions under the RPwD act of 2016. Registration fees is Rs 1000. Prior Registration is compulsory. The last date for Registration is 18 January 2019 Friday. The number of participants is restricted to 100. This activity qualifies for Twelve RCI credit pointsof RCI. Attendance at all sessions is compulsory, to get credit hours. The registration fee includes the registration kit, vegetarian lunch and refreshments during the sessions. Economical dormitory type stay can be arranged, on prior request and on payment, subject to availability. Venue: SRM Medical College Hospital & Research Centre, Kattankulathur. Biodiversity and Conversation, Plant Molecular Biology, Plant Breeding and Genetics, Genomics and Gene editing, Plant Physiology, Transgenic plants, Taxonomy and Molecular Systematics, Plant Pathology, Plant Biotechnology, Medicinal Plant Research, Food, and Agriculture. Workshop on "Foundations of Virtualization"
Organised by the Department of Information Technology, SRM Institute of Science and Technology. The basic infrastructure of the cloud is empowered by virtualization. It enables the delivery of intricate cloud services that is easily scalable in a cost-effective manner. One fundamental attribute of virtualization is the concept of partitioning. This enables supporting of multiple operating systems under one single server. Being in an individually enclosed environment assures of enhanced security without being intruded by the other machines and preserves individuality from other applications. Virtualization has enabled the cloud to be sold as a commodity based on utility. Last Date for completing registration form - Jan 22, 2019. Workshop on "Enterpreneurship and New Venture Creation"
Workshop on "Entrepreneurship and New Venture Creation"
Prof. Muthamizhchelvan, Director (Engg &Tech), SRM Institute of Science and Technology welcomed the delegates and participants. Dr. T .P. Ganesan, Pro-Vice-Chancellor (Planning & Development) delivered the Presidential Address. Prof. Richard W. Siegel, Founding Director, US National Science and Engineering Center for Directed Assembly of Nanostructure, delivered a special address. All the abstracts of the conference were compiled and released as conference proceedings. The same has been given in the USB chip attached with ID card to all the delegates and participants. All the Keynote, Plenary and Invited speakers were honored on the stage during the inaugural function. Dr. S. Ponnusamy, Professor and Controller of Examinations proposed vote of thanks. The ICONN2019 comprised of 5 parallel sessions totaling 40 individual sessions. 1 keynote lecture, 13 Plenary lectures, 76 invited lectures were delivered by leading experts from 19 countries around the world. In addition, 152 contributory Lectures and 1543 posters presentations were made. All the technical sessions were ably chaired by the invitees of ICONN 2019. Expert Panels of ICONN-2019 selected 10 best Posters and 3 best oral presentations. In addition, Nature Nano Springer selected 3 best Posters and 3 Posters from Computational Nanotechnology selected for Prof. Kawazoe award. The Conference provided a platform to discuss and interact with young and dynamic researchers sharing their experience, innovative ideas and the challenges in Nanoscience and Nanotechnology. It also provided the experts and young researchers an opportunity to explore collaborative opportunities. In addition to regular scientific sessions, to promote collaboration, interaction meetings were arranged on Sensors, 2D Layered materials, Photonics, Batteries and Computational Nanotechnology during the conference. The Fifth Biennial International Conference on Nanoscience and Nanotechnology (ICONN-2019) was organized by Department of Physics and Nanotechnology, SRM Institute of Science and Technology (SRMIST), Kattankulathur, in association with Shizuoka University-Japan, GNS Geological and Nuclear Sciences (GNS) Science-New Zealand, National Chiao Tung University (NCTU)-Taiwan, CSIR-National Physical Laboratory (NPL)-India, Asian Consortium on Computational Materials Science (ACCMS) and The Institute of Engineering and Technology (IET). The conference is aimed at providing a platform for researchers and scientists to assess recent trends and developments in Nanoscience and Nanotechnology for promising applications. Scientific Sessions of the conference includes Nanostructures materials and thin films, Nanoelectronics, Nanosensors and NEMS, Nanophotonics and Plasmonics, Nanomagnetism, to mention a few. More than 90 scientific sessions were held with eminent speakers from renowned international institutions such as Massachusetts Institute of Technology - USA, Rensselaer Polytechnic Institute - USA, Shizuoka University - Japan, University of Rome Tor Vergata - Italy, Kyung Hee University - South Korea, Russian Academy of Sciences - Russia and also from premier Institutes of India such as IIT Madras, IIT Kharagpur, IIT Guwahati, Indian Association for the Cultivation of Science (IACS) and CSIR-National Chemical Laboratory (NCL). The total number of participants at the conference were about 2000. SRMIST also honoured eminent scientists Dr. Yasuhiro Hayakawa, Professor, Research Institute of Electronics, Shizuoka University, with SRM-ICONN Life Time Achievement Award for Research Promotion, Dr. C. Nithya, Department of Science and Technology (DST)-Woman Scientist, National Institute of Technology (NIT), Trichy with SRM-ICONN Outstanding Woman Researcher Award and Dr. D. Mallikarjuna Rao, Scientist D, Indian Association for the Cultivation of Science (IACS), Kolkata, with SRM-ICONN Young Researcher Award. In order to encourage young researchers best research awards for poster presentations were presented by Springer Nature Nano. The conference welcome address was delivered by Dr C. Muthamizhchelvan, Director (Engineering & Technology), SRMIST, India, followed by a note on the conference by Dr D. John Thiruvadigal, Convener, ICONN 2019. Dr T.P Ganesan, Pro Vice-Chancellor (Planning and Development) addressed the initiatives taken by SRMIST in raising research standards in the field of Nanoscience and Nanotechnology. A special address was delivered by Prof. Richard W. Seigel, Founding Director, US National Science Foundation, USA on Nanoscience research developments across the world. Padmasri Prof. Ajay K Sood, President, INSA, New Delhi, delivered the inaugural address on elevating research in the field Nanoscience to meet international standards. Dr R. Balasubramanian, Pro Vice-Chancellor (External Affairs), SRMIST and Dr N. Sethuraman, Registrar, SRMIST, offered the felicitation and the inaugural function was concluded with a vote of thanks by Dr S. Ponnusamy, Controller of Examinations, SRMIST. CNE on "Eminence and Innovations in Newborn Care"
Our CACR is actively involved in the development and production of many precast Geopolymer concretes as alternate to Portland cement concretes in CASHUTEC Nirmithi Kendra, Raichur, Karnataka. More than 35 building products have been made on field and they will be assembled in the proposed national Geopolymer Technology Demo Centre. This centre will be inaugurated in the presence of eminent personalities of the country from various organisations such as HUDCO, DST, BMTPC, PWD, State and Central Government organisations involved in construction fields etc. We are also actively involved in the organisation of the event. We are able to get Mr. Shan Kumar, (Chief Engineer of the Hickory Building Systems Pty Ltd, a leading innovative concrete construction company in Australia), for the inauguration function. We are also making technical/scientific presentations during the Awareness Workshop on Geopolymers being arranged the following “Inauguration of National Geopolymer Technology Demo Centre”.